Variety reports that big-band leader and film/TV composer Van Alexander has died at the age of 100. Cause of death is reported as heart failure. Click in image at right to read Jon Burlingame’s obit from Variety. Van Alexander (1915-2015), was a noted arranger and bandleader who got his start fresh out of high school and wound up becoming an Emmy Award-winning television composer. His first feature film score was for the Mickey Rooney comedy, THE ATOMIC KID (1954), a jaunty and fun-flavored score for the misadventures of a uranium prospector who survives being at ground zero during an atom bomb test. 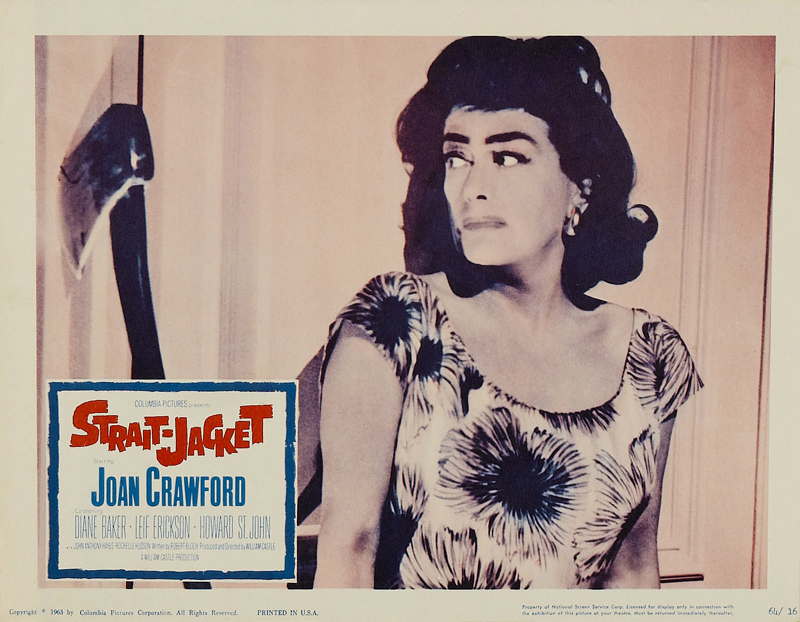 He scored William Castle’s STRAIT-JACKET (1965), a campy but potent psychological thriller neatly written by Robert (Psycho) Bloch, providing the kind of generic, Americana-styled music that abounded in Hollywood films of this period – at least until Lucy Harbin (Joan Crawford) arrives home unexpectedly, picks up an axe, and chops her unfaithful husband to pieces, at which time Alexander lets his orchestration fly, enhanced by the wavering sound of a Theremin, vividly illustrating Lucy’s madness. The Theremin does not reappear in the film, as Lucy’s potential recurrence of madness is left ambiguous as the story plays out. In contrast, Alexander provided a very stylish and opulent melodic theme associated with Lucy’s more glamorous side. Alexander had a great knack for unobtrusive but enjoyable melodies, and much of STRAIT-JACKET’s music could have appeared in any genre of film – but Bloch’s carefully developed psychological underpinnings as Lucy, released from prison, is reunited with her now-grown daughter and begins to exhibit signs of recurring madness, gave Alexander an opportunity to score some splendid mysteriosos and edgy, over-the-top shock music, such as the savage, choppy brass attack when Lucy’s former doctor meets his end at the edge of an axe, and the numerous filigrees and false crescendos that accompany the film’s many visual red herrings. The score is especially virulent during the climax when the killer is unmasked. Alexander teamed up with Castle again for 13 FRIGHTENED GIRLS (1963), composing a very Vic Mizzy-styled score brimming with breezy melodies and raging with brassy dissonances, but overall it’s a sitcom-styled score except for a rousing opening overture which sets the stage for the schoolgirls’ arrival in Switzerland. 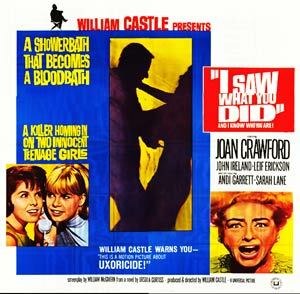 A final collaboration with Castle as well as Crawford came about in I SAW WHAT YOU DID (1965), also a fine but fairly generic and light-hearted orchestral score, although he did provide some effective menacing orchestrations as the two girls’ telephone pranks begin to get out of hand – and his raging brass attack for the film’s PSYCHO-like shower murder scene is quite potent indeed. The score has a kind of Hayley Mills-meets-Norman Bates sensibility that fits the film very well. Alexander’s use of piano along with the orchestra as events heat up is especially effective. Alexander also provided a lush, brassy score for the jungle adventure, TARZAN AND THE VALLEY OF GOLD (1966). For television, he composed episodes of BEWITCHED, I DREAM OF JEANNIE, and others.